Tracks 5 and 6 are available as MP3 only. "The only German word I know is Scheisse"!!! Brooklyn producer, remixer MC KOVAS (Timberland, De La Soul...) gets to the point. 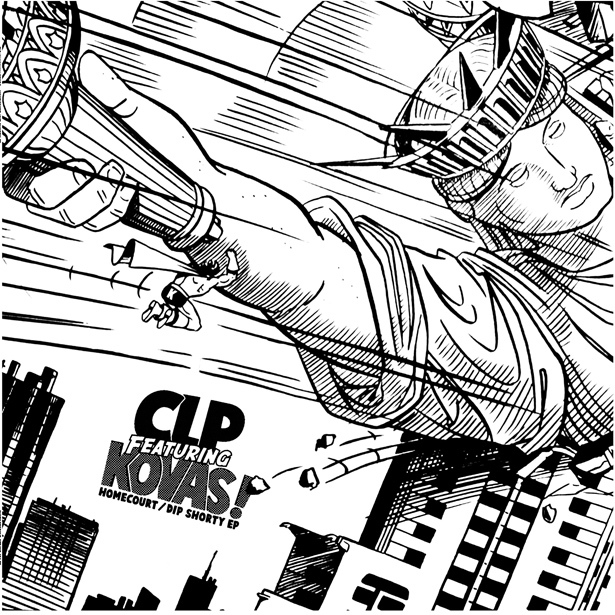 Shitkatapult´s 101st release honours the Ghetto Beat, a wild mixture of Rap, Hop, Booty Bass, Favela and Techno by CLP (Chris de Luca vs Phon.o) featuring KOVAS. Two german producer and one NYC rapper posse up to deliver "HOMECOURT/DIP SHORTY" like a multi-culturural musical hot pot in order to push the idea behind CLP´s great SUPERCONTINENTAL album over the limit. A Side "HOMECOURT" appears as exclusive new mix by CLP themselves, who stripped down the vocals into dub areas. Cut up fragments, steaming beats, screaming arrangements for all neo-dancefloors bfrom sao paulo´s backstreets to hamburg´s golden pudel club. A2 showcases a maximum eurodance supermega remix of HOMECOURT by Berlin´s nasty techno darling HOUSEMEISTER (bptich, all you can beat...) who shows us a good dressing down. This is dancefloor. B Side opens up with the funky album version of "DIP SHORTY" and gets completed by the young Berlin beat juggles of BUGATI FORCE (Exploited). BUGATI FORCE names the overkill of Neo-Rap History of tomorrow in every style. Their "DIP SHORTY" remix is pure and clever fun. Kick it, yes you can.